Eye Magazine | Blog | AGI Open – the ‘graphic design World Cup’? The designers were all members of Alliance Graphique Internationale, or AGI (usually pronounced ‘argy’, with a soft ‘g’), the invitation-only association of that has included some of the world’s most famous and garlanded graphic designers since its foundation in the early 1950s. 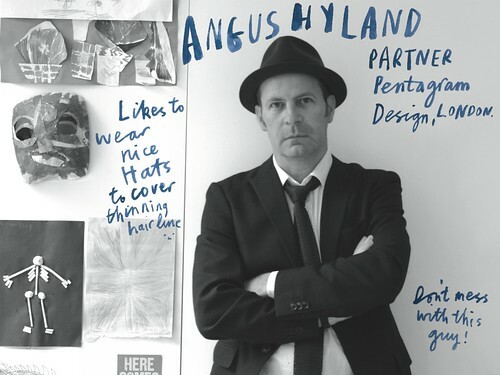 Marion Deuchars: hand-lettered photograph of Angus Hyland, Pentagram. Both will speak at AGI Open, London 2013. 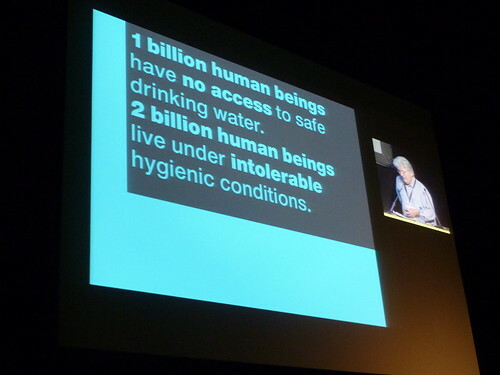 Top: Tony Brook discusses the merits of the grid at AGI Open 2011, Barcelona. AGI holds a Congress for its members each year, but in recent years the Alliance – more private club than professional organisation – has been reaching out to a wider public, including students, with AGI Open events in Porto (2010) (see ‘What makes designers tick?’ by Jan Middendorp in Eye 78), Barcelona (2011) (read ‘Who’s who’ on the Eye blog) and Hong Kong (2012) – an important parallel and public strand. 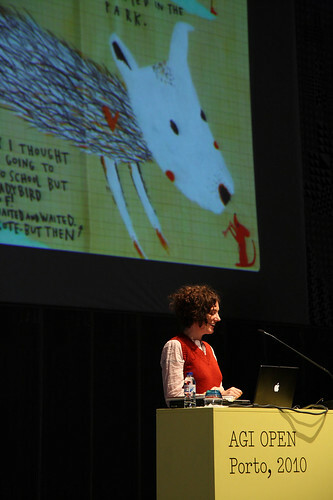 Illustrator Sara Fanelli at AGI Open Porto. AGI members have gathered in the UK before (in Bath and Cambridge) but 2013 is their first time in London. Deuchars compared it to ‘having the World Cup in London’ – it’s not something that happens every year. Other UK AGI members went into more detail about the two-day public event, which accompanies the private AGI Congress. It will all take place at the Barbican, using the 2000-seater concert hall and making full use of all the arts centre’s spaces. ‘There will be no “Green Room”,’ said Tony Brooks. The idea is to make the AGI members accessible to the attendees most of the time. Lars Müller at AGI Open, Barcelona, 2011. Fortunately, the Barbican, with its bars and restaurants, is able to offer rather more than a cup of milky tea. North founder Sean Perkins described the architecture of the complex as a ‘really inspiring space’ and waxed lyrical about the hall’s audiovisual qualities (illustrated by a picture of a large orchestra). Though AGI has changed over the years, admitting younger designers with slightly more diverse backgrounds, it retains something of its 1950s roots, when it was more of a gentlemen’s club, and ‘graphic design’ was hardly recognised by the world at large. So the student-facing focus of AGI Open is a relatively recent and welcome development. Some of the design educators at the launch worried about the ticket prices for the event (which is nevertheless run on a not-for-profit basis) and there was talk of organising a network through which London attendees could provide a bed on which out-of-town students could sleep. Another remarked that he would be disappointed if there were no orchestra. All the speakers will be AGI members (apart from interlocutors such as Creative Review editor Patrick Burgoyne, Eye columnist Rick Poynor and Eye editor John L. Walters) and the line-up includes some designers rarely seen or heard in the UK, including Lars Müller (above), Pierre Bernard (below), Kenya Hara, Pablo Martin, Marian Bantjes and Ben Bos. 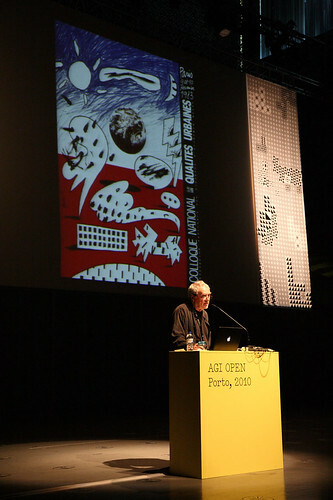 Pierre Bernard at AGI Open in Porto, 2010. Read ‘Due process’ by Jan Middendorp, ‘Who’s who?’ and ‘Up and down the City Road’ on the Eye blog. Eye is the world’s most beautiful and collectable graphic design journal, published quarterly for professional designers, students and anyone interested in critical, informed writing about graphic design and visual culture. It is available from all good design bookshops and online at the Eye shop, where you can buy subscriptions and back issues. You can see what Eye 84 looks like at Eye before You Buy on Vimeo.